with 1 king-size bed, 1-queen size bed and 4 twin-size beds and 1 daybed. The large living room is perfect for everyone to spread out and relax. The kitchen is equipped with all the amenities of home and comes fully equipped including stainless steel appliance, granite counter tops and upgraded cabinetry. The benefit of a fully equipped kitchen is that you decide when to stay in and when to eat out, saving you money. The dining area is perfect to enjoy meals together as a family. There is also a washer and dryer for your convenience along with cable TV and free high-speed WIFI internet and free local phone calls. The private heatable splash pool is ideal for those who want to cool off or lie out and tan in the beautiful Florida sunshine. This townhome will bring the excitement of Disney to you and will help create awesome memories.All furnished in a contemporary style. There is also a full-size washer and dryer. This townhome will bring the excitement of Disney to you and have the kids talking about your trip for months to come. 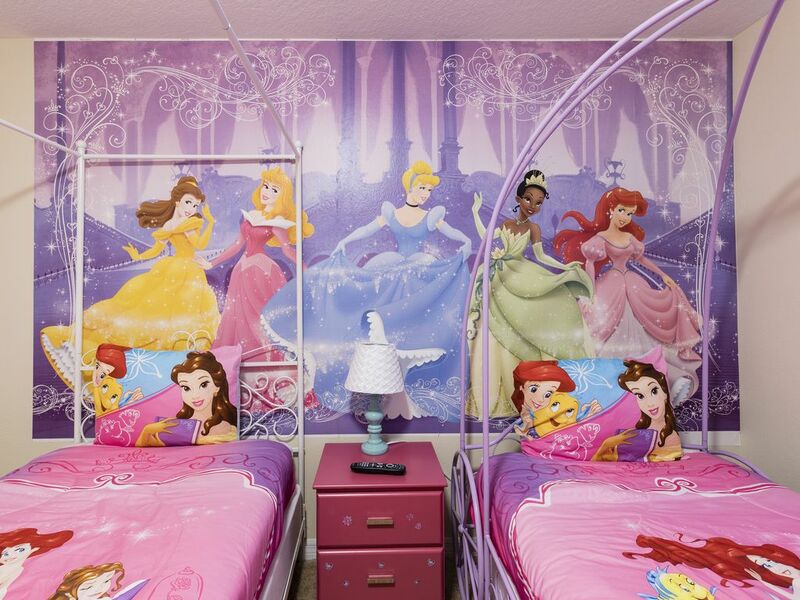 The kids will love the Disney Princess bedrooms and Mickey Mouse bedroom. My family and I have stayed at Paradise Palms 5 times and this is the first time we have ever felt the need to leave a bad review. We encountered numerous problems with our stay. The most glaring was the televisions not working in multiple rooms and the dryer being broken for the entire stay. The most frustrating part about the dryer, is they knew 2 days before we arrived that it was not working properly. If someone would've just gave us a heads up we would've packed differently. You could also tell you were getting the runaround the whole time with regards to the problems being fixed. We were there for 8 nights and neither problem was resolved. We were given numerous "pass the buck" responses. Just remember we were there for 8 nights and neither problem was resolved. The property as a whole leaves a lot to be desired, it is just not as good as all the paradise palms units we've stayed at in the past. The blinds are broken in multiple rooms, the beds are torn up, no bar stools, a bathroom sized trash can in the kitchen, etc. My advice go elsewhere in Paradise Palms and get better value for your money. I'm sure there will be a response by the owners, but don't buy it. We've used VRBO 10-15 times and this is the first problem we've ever had. The neighborhood is very well located and has many amenities. The house is big, and it looks like it is shown on the web. It was clean anda has everything you need. The owners and the administrator were very helpful. We really liked our stay. It did not seem right not to be able to receive packages in our name without paying. We loved the property! The house is very clean and well kept, not to mention the kids rooms are decorated with very pretty Disney decor! The pool and outside patio are is perfect! The owners are very easy to reach and quick in replying! Definitely a house to enjoy with your family and friends! Very recommended. They even surprised us by having a lot of baby gear at the property which you can use! We found Jennifer’s home to be very clean, and the kitchen very well stocked. Travelling with a baby, we greatly appreciated all of the provided baby gear. We enjoyed both the plunge pool out back, as well as the large community pool. Jennifer responded quickly to all queries. Great location. One small point to clarify is that the outdoor grill mentioned in the posting requires an additional rental fee from another company. Overall, we would highly recommend staying here. Dear Cindy - thanks for clarifying the BBQ rental for us. We found it is hard to maintain the BBQ in a high standard (to clean and sanitize professionally; and keep the full tank of gas). So retained a 3rd party BBQ rental company to do the job. They will deliver the BBQ prior the arrival with full tank of gas and pick up after the check-out. The rate is same as we charged from our guests. To grantee our guests receive a safe and clean BBQ grill is our goal. Thank again for the feedback. This home is very large and very comfortable. There is plenty of seating in the living area and in the pool deck.Location was perfect for a short drive to the Magic Kingdom and other parks. I would recommend staying in this property to anyone, and when we are back in Orlando we will definitely plan to stay here again. We had a great stay. The house was big and spacious. We enjoyed using this home.